About 40-odd years ago, a bunch of young California misfits changed the world with new technology. Oh, you’ve heard this before? Well, it wasn’t a computer. It was bikes. Mountain bikes, to be exact. Now, it’s true that people have been riding on rough roads and dusty paths from the earliest days of cycling. But a perfect mix of competition, rapid technology development, and marketing strategy propelled what mountain bike pioneer Charlie Kelly calls a “goofy hobby” into global phenomenon and a new Olympic sport. Those athletes will roll up to the starting line in Rio astride the latest ultra-light carbon fiber machines with precision shifting, powerful disc brakes, and responsive suspension. And their bikes will look nothing like what the world’s first mountain bikers rode on Mount Tamalpais just north of San Francisco in Marin County, California. In the early 1970s, cyclists in and around Marin County started assembling “clunkers” using salvaged paper-boy bikes from the 1930s and ’40s and bombing down Tam’s paths and fire roads. In the video above, Kelly and fellow innovator Joe Breeze of Breezer Bikes describe those early days, and how the mountain bike evolved from junkyard dogs to purebred rock- and rut-eating rigs with full suspension and prices that can reach well into five figures. Now, when it comes to mountain biking, it isn’t enough to ride. As Kelly explains, someone eventually claims to be the fastest, and there’s only one way to settle an assertion like that. Brakes weren’t the only thing that took a beating. Kelly broke so many frames that he eventually asked Breeze to build him something stronger. “I wanted a secret weapon,” he says. In 1977, Breeze built the first of 10 frames inspired by his 1941 Schwinn’s dimensions. He used steel alloy tubing, and strengthened them with distinctive twin lateral tubes running diagonally across the frames. Then he outfitted them with new parts, creating the world’s first new, purpose-built mountain bikes. Breeze’s first frame, which he rode to victory in a Repack race, sits in the Smithsonian Institute. Breezer No. 2, which Kelly rode, is part of the collection at the Marin Bicycle Museum and Mountain Bike Hall of Fame not far from Mt. Tam. Breezer No. 2 on display at the Marin Museum of Bicycling in Fairfax, California. The museum is a shrine to the days before Lycra, helmets, and sick GoPro edits. “It was team Levi’s” says Breeze, pointing to a photo of him at the museum dressed head to toe in denim. The bikes were heavy, too—Kelly’s first rides weighed 38 pounds, nearly twice the weight of a modern cross-country racer. Still, Repack, which Kelly chronicles in Fat-Tire Flyer: Repack and the Birth of Mountain Biking, pushed the tech forward. Then a TV crew documented a Repack race. Clunking subculture soon spread, and demand for bikes spiked. 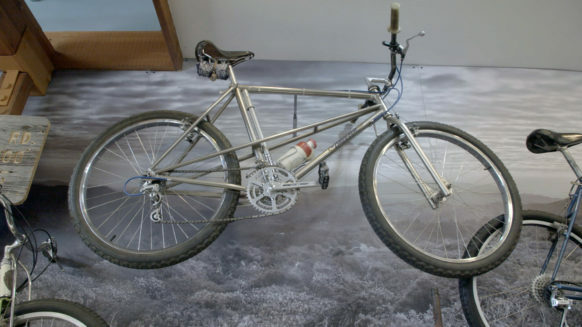 The museum features beautiful examples of steel-framed machines from early craftsmen like Tom Ritchey, Mert Lawwill and the Koskis as well as early aluminum frames built by Charlie Cunningham, who also designed many early off-road-specific parts. By the early 1980s, Specialized Bicycles was mass-producing its Stumpjumper mountain bike. Others responded with MTB-specific components and tires. By the end of the decade, many offered bikes with motorcycle-like suspension; disc brakes weren’t far behind. In 1996, 20 years after the first Repack, mountain biking debuted at the Atlanta Olympic Games. Racing still pushes technology and design. Earlier this year, Sea Otter 2016 hosted the first electric mountain bike race. But the lasting impact of the mountain bike, with its cushy tires, upright handlebars and sturdy frame, Breeze says, may be the millions who took to them, not for hopping rocks, but for commuting and running errands around town. “It really spawned a lot more interest in city riding and the utility of bicycling for everyday,” he says. For Kelly it was all about Repack, which is hallowed ground, as far as he’s concerned. “The racing started us on this journey that we’re still on,” he says. This fall, on the 40th anniversary of the first Repack, a group of cyclists will gather at the top to celebrate just how far their goofy hobby has come.